I hope your spring (or fall, depending) is going well! I have always gotten such a kick out of the names for those two seasons. Right after winter, there is a "spring" in our step and then just before winter we "fall" prostrate in anticipation of the cold days to come! Thank you for your words of encouragement and advice on my last post about my marathon reorg. I enjoyed reading all your thoughts and I'm enjoying my uncluttered and clean space. 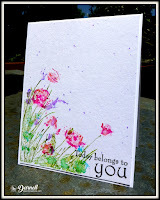 Today I've got a card with happy springtime colors for you. The flowers are being blown by a warm spring breeze. It's been very windy here after our very rainy winter. I love it, but I've had to put Hammy on a leash when we go outside. I remember when we ladies had big ratted hair held together with tons and tons of hairspray. God help the boyfriend or husband who happened to roll down the car window driving down the road. "My hair! My hair!" The NBUS wildflower stamp is by Rubbernecker and I've had it for ages. I was delighted to finally give it a whirl, coloring it with my Ziggies and then spritzing and stamping it. Looking at the photo now, the design seems to be crying out for a butterfly, don't you think? Yes, I think I'll add one. And speaking of butterflies, those pretty purple bits look like our butterfly bushes which are just starting to bloom! 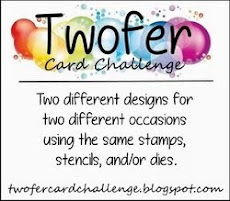 CAS Mix-Up Card Challenge: Stamping, Splatters, Direct-to-Stamp/Spritz Watercolors. CAS Watercolour Card Challenge: Flowers. Darnell this is beautifully designed and I love your creative flair. Wow Darnell, I love this!! The bright colours, the design: everything is so nice. Wow this is gorgeous!!! I haven't used that technique in years. Hmmm, just might have to give it a go again. Thanks for the inspiration. Hi Darnell, I love the card. My dad had several Butterfly bushes in his garden. He found it was when the flowers started to die off, that was when the butterflies seemed more interested. Krasna voščilnica. Zelo mi je všeč. Beautiful card Darnell, love the colours and the just cottage garden look of this card. Now let me tell you something that I find rather embarryissing, I was reading your comment about how you coloured the stamp with your Zigs then sprayed with water before stsmping. And its like a light went on ohhh my god I am reading peoples comments how they use the distress ink markers to colour stamp then wet and I'm like 'such a shame I dont have those Distress Ink Markers, its so hard to use ink pads for same look' and yes I never ever thought to use my Zigs. Sometimes I think my blonde wig is just too tight, you know what I mean!!!!! What lovely wild flowers Darnell! Love your sweet, simple card! So glad you're enjoying your new space. Beautiful card, Darnell. I really like the simple design. Giggled at your windy stories! Coloring on the stamp and spritzing made this card so beautiful. It is realistic looking swaying in the wind. Oh the wind! We have had it too and so strong. It makes it seems twice as cool or cold depending on the temp. I bet Hammy just doesn't understand why he has that thing around his neck while trying to walk. Boy did you bring back memories of hair. I used to roll my hair up in huge rollers, spray it with beer and sleep on them. Then tease it within an inch of its life and smooth it over. Added three inches to my height! "watercolor stamping" is one of my favorite techniques, I really love it! It is the only "watercoloring" I think is not scary! :) Your card is beautiful, I love the layout and the CAS look. Fantastic card! Love the watercolouring it works so well for wild flowers - a match made in heaven! Fabulous card, sure does look like it is 'blowing in the wind' love it Darnell! I have some rubber stamps that I must give this technique a try with the zigs!! Heart Hugs, friend! My butterfly bushes are beginning to bloom, as well, and, because of all the rain, methinks this is going to be a good year for them. Aren't you glad you found this little jewel of a stamp. Looks lovely colored with your zigs...and I like the sentiment, too. It's absolutely lovely! Our buddleia hasn't flowered yet... they usually flower within the next few months. Have a beautiful day! STUNNING COLORS! STUNNING DESIGN! Ya think that my clean and simple lovin' heart raced when I saw this? Yep, sure did! WHOOPS! Forgot to say "beautiful picture of the butterfly plant! The blossoms are SO vibrant!" I'm in love with this card, I had to stare at it a long while. Wildflowers blowing in the gentle spring breeze, sigh! I think I'm going to have to dig out my old Rubbernecker and see what I can come up with. Beautiful card Darnell. Love that type of watercolored look. I never thought of using my Ziggs to color on a stamp. Have a great day. Our butterfly bush is beginning to bloom too and I've been seeing lots of butterflies flying into the gum trees. I believe that's where they like to lay their eggs. To bad the caterpillars done eat gumballs instead of leaves! Love, love, love you windswept wildflowers! I think you need to use them lots and this technique is perfect for them. A butterfly would be nice but not necessary. Thanks so much for creating a card for CAS Watercolour and CAS Mix Up! I hope you and Hammy enjoy that spring in your step! I've been out of the loop, D. but had to say: this is my favorite of all your fabulous creations [to date!]. LOve the water-colored feel, the yearning for that butterfly, and oh yes, that gorgeous dark purple of your butterfly bush! I love the "wind" in this card. He is amazing I love the colors of ZIG beautifully mixed, watercolor is unusual. Wonderful, wonderful, wonderful. And delicate violet dots perfectly filled the composition. I love your beautiful water colored floral image with those pretty colors you chose. So fantastic looking they are and a great spring design. And, I never looked at the names of the season in the way you did before. LOL That is clever and maybe more true then we know. Thanks for sharing your wisdom and talents today. Ooooh, I really like this one! It looks like a watercolor painting, very Monet-esque! Love that pink! 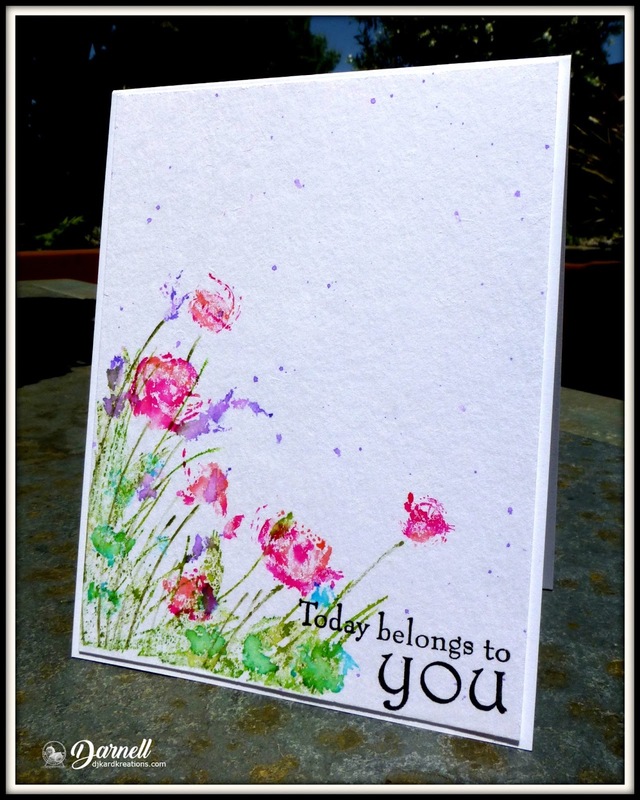 Love the softness of your stamped images and yes, a butterfly would finish it nicely! Amazing frilli look for your flowers, this card is so bright and happy! Beautiful card Darnell. Love the look of the flowers. The butterfly bushes look beautiful. That'll definitely make a beautiful stamp! Gorgeous wildflowers, Darnell! 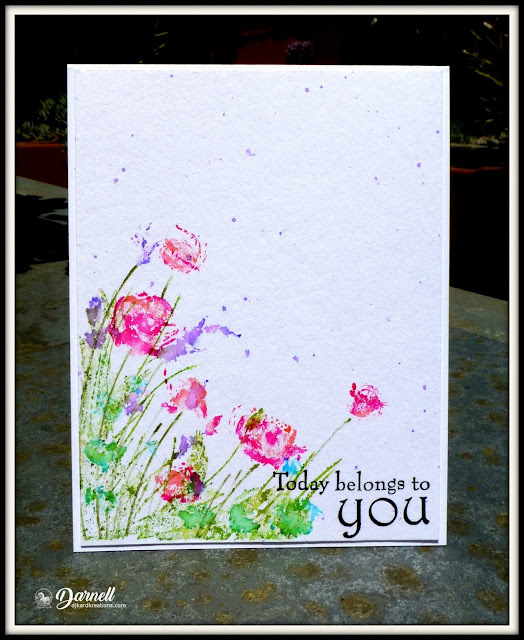 I love how you stamped them to create an airy movement on this card...so pretty! So, Hammy is on a leash now? You are too funny! So glad your reorg project went well, and that your butterfly bushes are starting to bloom...they're beautiful! Oh, my, that's such a pretty stamp and a delightfully clean and fresh card! I love seeing your NBUS while I work my way through my own Mt. NBUS at the same time. Looks like the Zigs worked beautifully for this technique and you did such a good job of it. We had a couple of very windy days here, too, but chilly - brrrr! My butterfly bush is nowhere near close to blooming, but I sure look forward to it when it does. I can feel that warm breeze and smell those sweet blooms Darnell. I love this clean gorgeous card. Gorgeous card, Darnell. I like this soft and subtle look the zigs have given to this card. Spraying them with the water makes all the difference! So pretty, Darnell! Love the blowin'-in-the-wind style of your image. And, yes, I think a butterfly would look great. Have a great rest of the week, my friend. This is absolutely stunning. Love your colors too! Beautiful card and photo, Darnell. There were so many comments I barely found my way to the bottom and now I've forgotten what I wanted to say..............I must be getting old. I'm sure it was to tell you that your card was beautiful. This is simply stunning!! I LOVE the soft way you stamped these flowers and used that great sketch design. I think this would be a pretty card to frame. Nice reminder for someone to see everyday!! Your card is absolutely gorgeous and we ALL think so!! Lovely spray of windblown flowers - and beautiful colours! Great use of your Zigs and spraying with water. Loll, Nancy, and I are getting behind on commenting on CAS Watercolour cards because we're all having way too much fun creating together. We'll have to invite you up to join us if we do it again!! I'm glad this is one of the stamps you decided to keep, Darnell, because this is a fabulous watercolory wind-in-my-petals kind of card. Yes, a tiny butterfly would look good, or maybe a dragonfly which is what I added to my wildflowers. Darnell this is just perfect! Love the colors and it looks great as is but I think it would look good with a butterfly too! Thanks for joining us at THD! Now THIS is an true example of the less-is-more concept. Absolutely gorgeous...and yet so simple. I can't believe this stamp was NBUS, but so glad that you dug it out and shared with us! So pretty! It is beautiful without a butterfly but I can see how it might look with one too :) Have a great weekend. These flowers looks as though they were blowing in a soft wind! What an elegant and gorgeous card, Darnell! I love this stamp and the colours you've used. Very summery. We used to have an old Landrover and Mr C was always keen to take the lid off on a warm day. I'd always arrive looking like a witch. Happy days! Oh, is already here, a new card from you! :-) Wonderful motiv and fabulous colouring. Oh my goodness, Darnell--one of my all-time favorite cards! That is the perfect stamp to use for that technique! Happy Mother's Day, my friend! Pretty card! 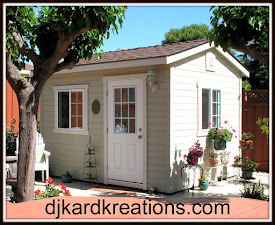 Glad you managed to get your craft room finished. I'm still working on mine...WHAT A JOB!!! What a beautiful card! Love how you watercolored those pretty flowers! Such a spring time card--our's is rapidly disappearing with temps around 90º!!! We have had a milder spring though, by Texas standards, so can't really complain! Glad you've gotten your space all cleaned up and organized! That is such a good feeling!! Hugs!! What a beautiful card. Looks just like a watercolour painting. Our buddleia doesn't flower until mid Summer but the butterflies love it. Nevermind the window down, it's worse with a convertible ...... the wind in your hair and the bugs in your teeth, happy days lol! Oh gosh - just love this card! Such pretty colors and I love the artsy look about it. Fabulous! Oh my, this is a beauty! 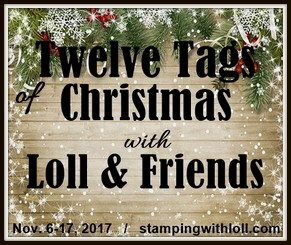 Such perfect stamping and your color choices are lovely! These wildflowers are so pretty - they look like painted! Love the concentration in one corner and the splatters! It's fabulous as it is but an added butterfly would be lovely, too! excellent card, now i have an Idea to create my own Cards, adding custom stickers would make it stunning. 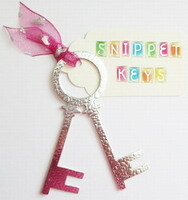 This is so lovely- such fun texture created when zigs are used that way! Glad you have a leash for Hammy! Thanks for joining us at The Heart Desires Challenge! Hi Darnell, love your wind swept flowers, so pretty. Love this card so much, it has a real artistic flow about it, like it should be framed and on a wall. Just beautiful!! Posted too soon. Congratulations on getting outstanding designs for both CAS Mix Up and CAS Watercolour this month. 👏🎉🎉 Gorgeous card and so well deserved. Have a great rest of your weekend. Congrats on the HM at CAS Mix Up! What a gorgeous card, Darnell! And congrats on CAS Watercolor shout out! This is oh so pretty!! !Absolutely gorgeous! 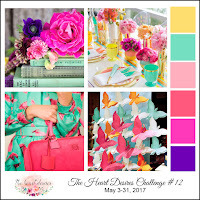 Thanks so much for playing along at The Heart Desires Challenge! Hope to see you again next month!